Fundraisers: St Vincent de Paul Society Queensland chief executive officer Peter Maher, GlobalX chief executive officer Peter Maloney, and Tradettes chief executive officer Helen Yost are preparing for the 2018 Vinnies CEO Sleepout. A SUCCESSFUL Brisbane businesswoman remembers sleeping in her family’s car as a child and escaping family violence as a teenager. “We slept in the back of mum and dad’s car because we had no house. I was so scared,” Helen Yost, an ambassador for Vinnies CEO Sleepout, said. Ms Yost is the founder and general manager of all-female plumbing company Tradettes and spoke at the launch of this years event to be held in June. “I’ve been homeless twice – once as a child and then again as a teenager,” she said. “At 14, I had to leave home because of dad’s alcoholism and domestic violence. “I slept on friend’s couches for six months then moved back because I had nothing else. These early setbacks haven’t stop Ms Yost in life. A qualified plumber, Ms Yost now runs the first all-all female plumbing and landscaping business in Australia – which has been operating since 2013. She is a parishioner at St Joseph and St Anthony, Bracken Ridge, and her two daughters attend St Joseph’s Primary School. “Being poor and homeless as a child forced me to think – what can I do to help prevent this happening to other people? The best way is to create awareness and education,” Ms Yost said. The Vinnies CEO Sleepout 2018 event was launched nationally last week, with organisers hopeful of raising $6.4 million. Founder Bernie Fehon said it was one of the biggest fundraising events in Australia. In Brisbane this year’s event is expected to attract more than 220 leaders to sleep on the cold hard concrete base of Brisbane Powerhouse on the longest night of the year, the winter solstices, June 21. The annual event is a show of recognition that each night, almost 6000 people in Brisbane and almost 22,000 Queenslanders have no place to call home. St Vincent de Paul Society Queensland chief executive officer Peter Maher said: “It’s appalling that as we are getting wealthier as a nation, we can’t provide people with food and shelter in the 21st century”. This year, the Vinnies CEO Sleepout Brisbane aims to raise $1 million, with funds to make a direct and real difference in the lives of those who are experiencing or are at risk of homelessness. “We’re putting vital funds raised by this event into housing solutions and are calling on government, corporate and community members to get behind us and help turn around these statistics,” he said. Complicated situations have been blamed as the ultimate reasons behind these homelessness statistics. Rental housing is more expensive. The number of homeless people in Australia is increasing because it is challenging to find budget-friendly housing. Violence at home. People leave their homes to escape from the violence they experience within their households. Ironically, they feel safer if they are away from home. Poverty that runs across generations. Australians who come from homeless families almost always end up being homeless. Unemployment. Due to the economic issues, many people have to deal with long-term unemployment. As a result, they struggle making ends meet and end up becoming homeless. Mental disability. People having mental problems and those who suffer from psychological distress are most likely to stray away from their homes or even from mental institutions where they have been admitted and end up being homeless. Exiting from jail. Those who exit prisons find a hard time getting back to the real world due to few job opportunities. As a result, they suffer economically and many eventually end adding up to the homeless population. 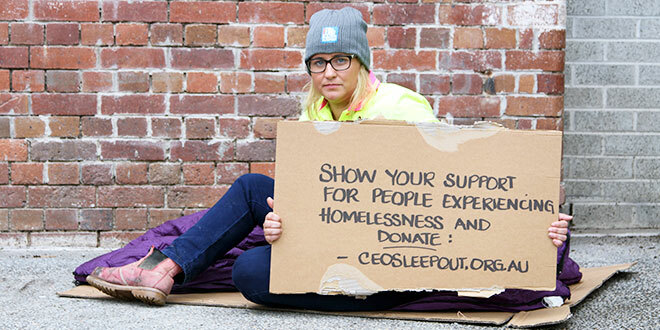 To find out more about the Vinnies CEO Sleepout or to sign up, visit www.ceosleepout.org.au.